No Payment required to submit an enquiry – we will email order details & payment options. 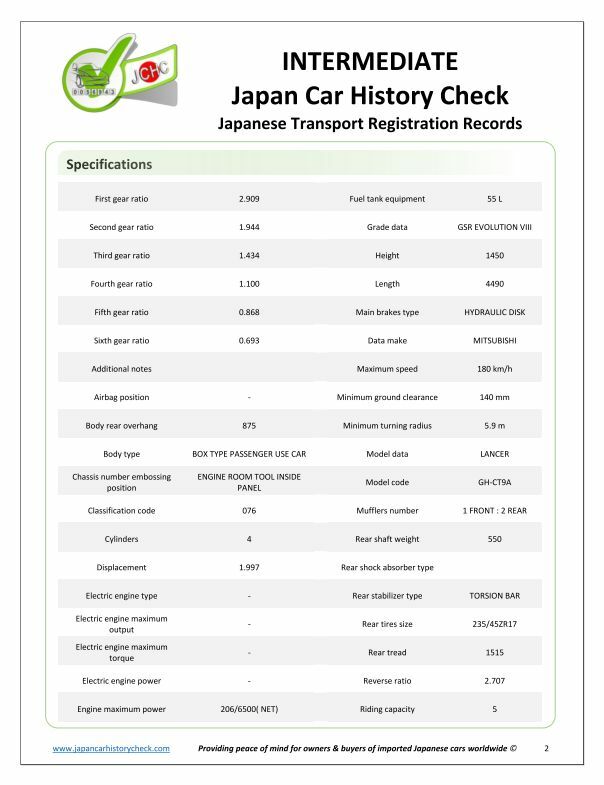 3 Japan began recording odometer readings at registration inspections from 2004 onward. 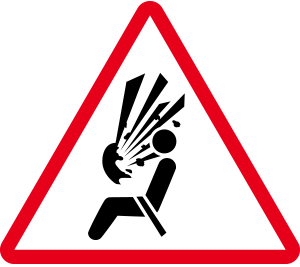 4 Up to the last two registration events only are retrievable (depending on vehicle age, export date & registration history / status). 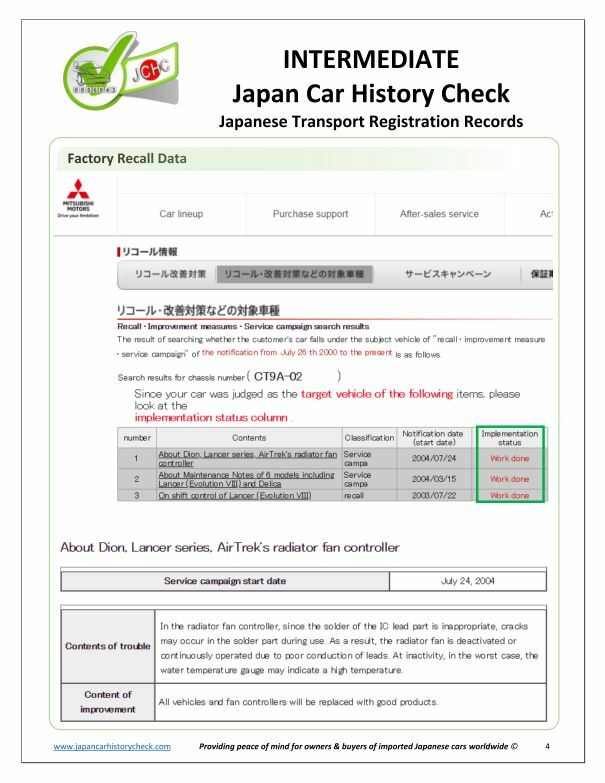 5Manufacture date & factory recall data available for Japanese makes only. 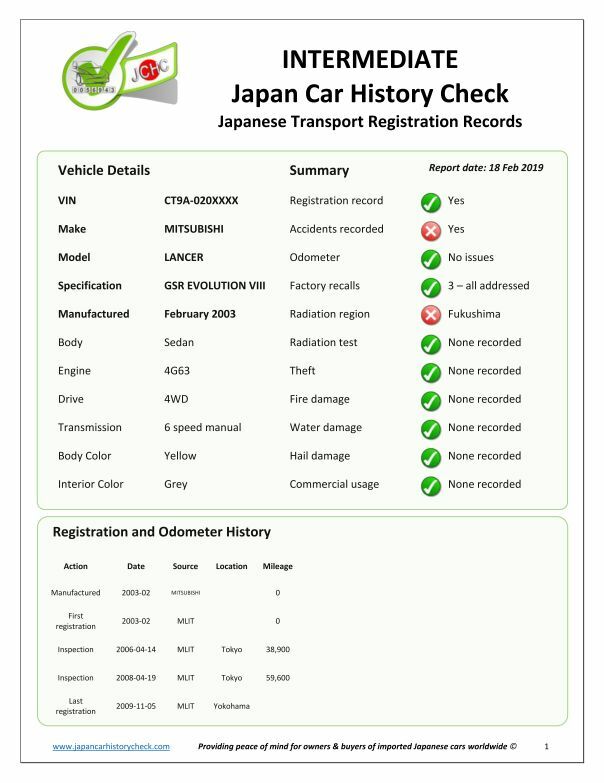 Please be certain the vehicle was registered in Japan within the last 15 years before ordering this check as we incur a cost once data has been sought from the Japanese Transport Authority (MLIT) – vehicles exported from Japan more than 15 years ago may have limited or no data available. 50% refund if MLIT has no record. 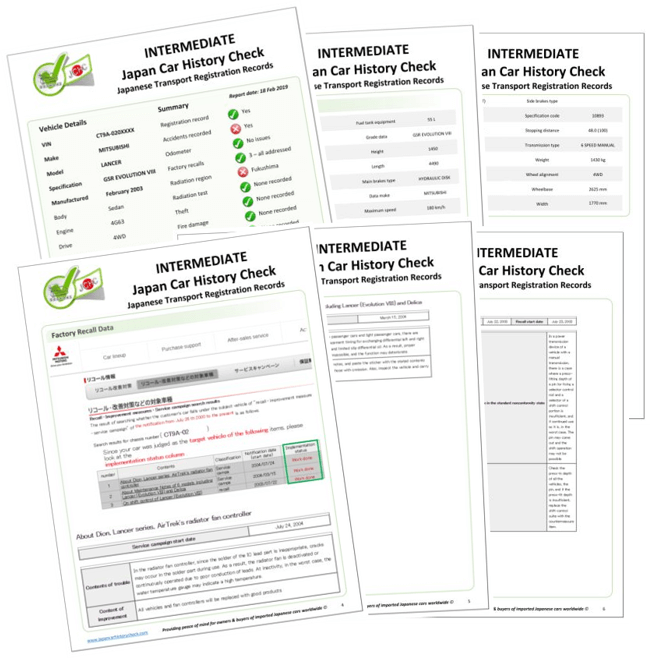 Along with general registration data, our Intermediate Check can provide the dates & odometer readings from up to the last two (2) re-registration inspections in Japan. 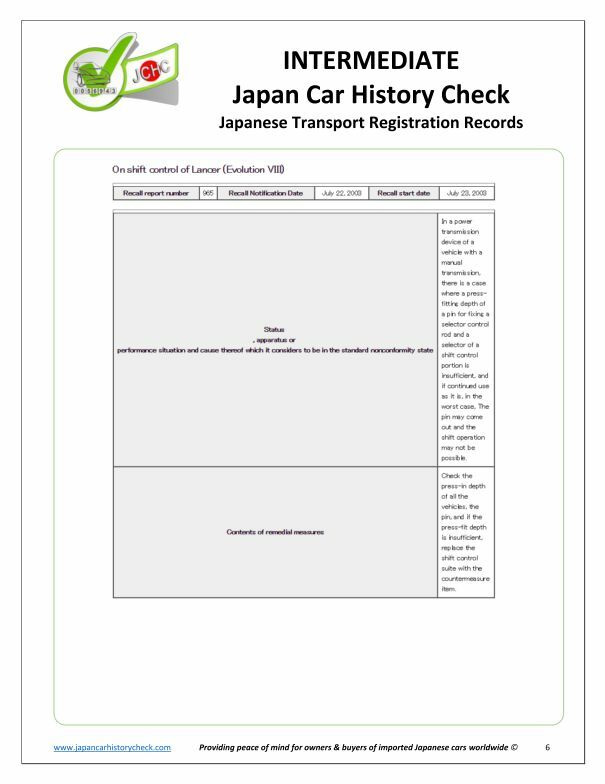 Vehicles are physically checked for re-registration as part of Japan’s mandatory safety inspection process. The Intermediate Check is most useful where auction records are not available & you don’t have the Export Certificate (or you’re not sure your Export Certificate is genuine). 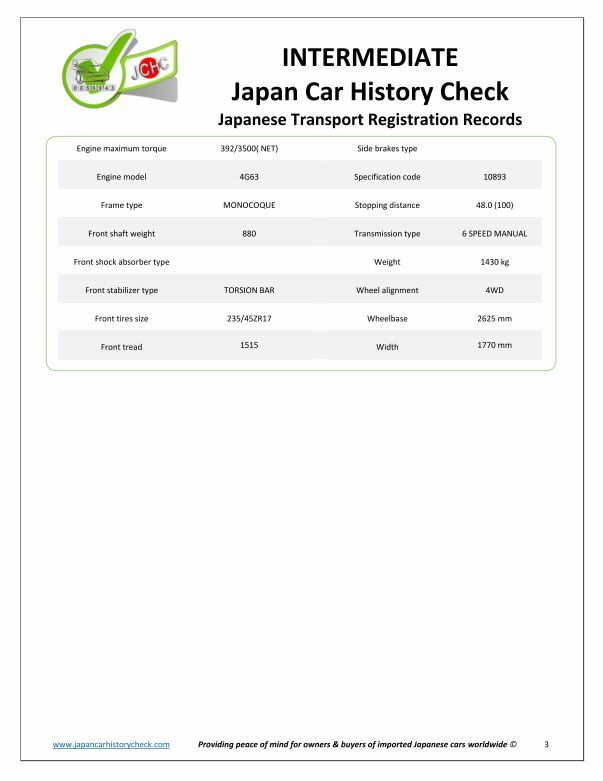 It will enable you to check the official mileage record in Japan against the current odometer reading, as well as compare the official readings against those shown on an Export Certificate copy supplied to you. From two Japanese odometer readings you can also get a snapshot of the annual mileage during that period & compare that against the age of the vehicle & current odometer reading. 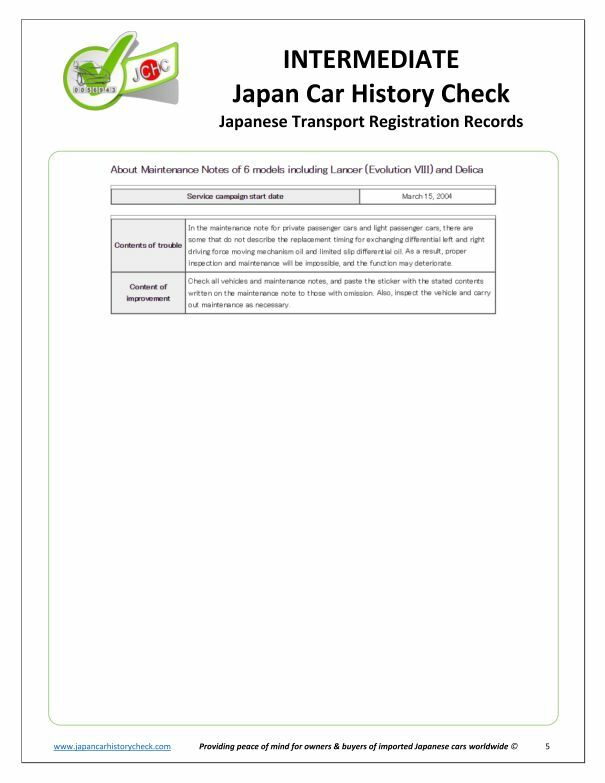 Registration for normal passenger cars in Japan expires after the first three (3) years, then requires renewal every two (2) years after that. 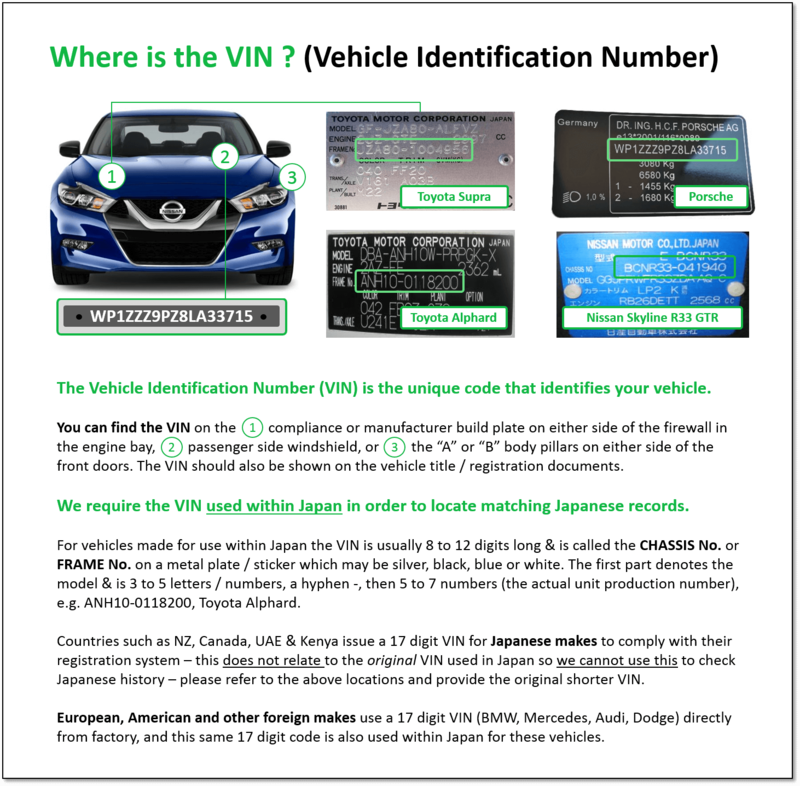 The Japanese registration data will also include the official de-registration date which is usually within a few weeks of the sale of the vehicle & 3 to 8 weeks before the export date. This date is useful as part of manually searching for auction records (if an initial auto-match of your VIN has not been successful on our system) & where you also don’t know the export date from Japan. 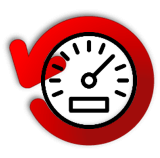 Our focus is on speed as clients often use this option as a pre-purchase check where time is of the essence. 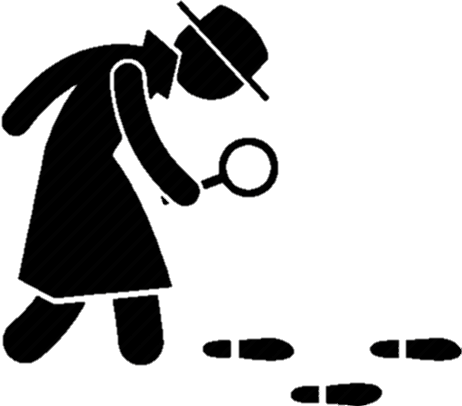 We obtain the raw data only from the Japanese authorities which is then provided in our Report in English. 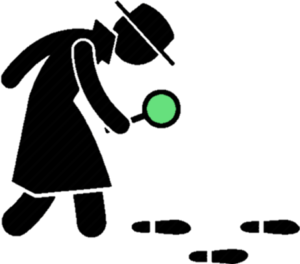 Where auction records are available we recommend our Basic Check as the best place to start as it will usually yield the most useful information. 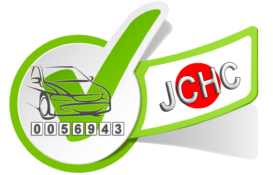 Of course if you feel you still require registration data then we can always upgrade to the Full Check later.